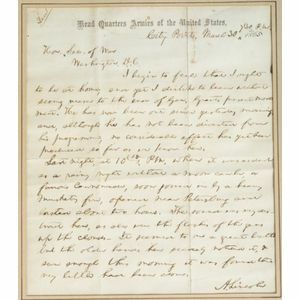 Lincoln, Abraham (1809-1865), Important autograph letter signed, one page, Head Quarters Armies of the United States, City Point, March 30, 1865, to the Secretary of War (Edwin Stanton), concerning war news and his account of hearing a battle, framed with portrait, (very good). Text in full: I begin to feel that I ought to be at home, and yet I dislike to leave without seeing nearer to the end of Gen. Grant's present movement. He has now been out since yesterday morning, and, although he has not been diverted from his programme, no considerable effort has yet been produced so far as we know here. Last night, at 10:15 P.M., when it was as dark as a rainy night without a moon can be, a furious Cannonade, soon joined in by a heavy musketry fire, opened near Petersburg and lasted about two hours. The sound was very distinct here, as also were the flashes of the guns up in the clouds. It seemed to me a great battle, but the older hands here scarcely noticed it, & sure enough this morning it was found that very little had been done. 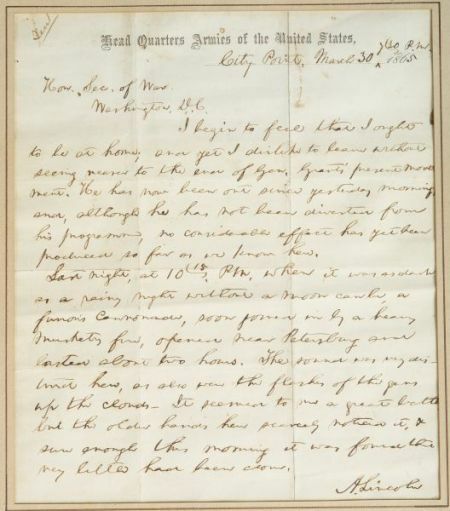 Note: An important letter, written at City Point, where Lincoln had gone to consult with General Ulysses S. Grant. Composed just a few days before his assassination.